Jupiter's got no sway. The biggest planet in the solar system has no tilt as it moves, so its poles have never been visible from Earth. But in the past two years, with NASA's Juno spacecraft, scientists have gotten a good look at the top and bottom of the planet for the first time. What they found astounded them: bizarre geometric arrangements of storms, each arrayed around one cyclone over the north and south poles–unlike any storm formation seen in the universe. 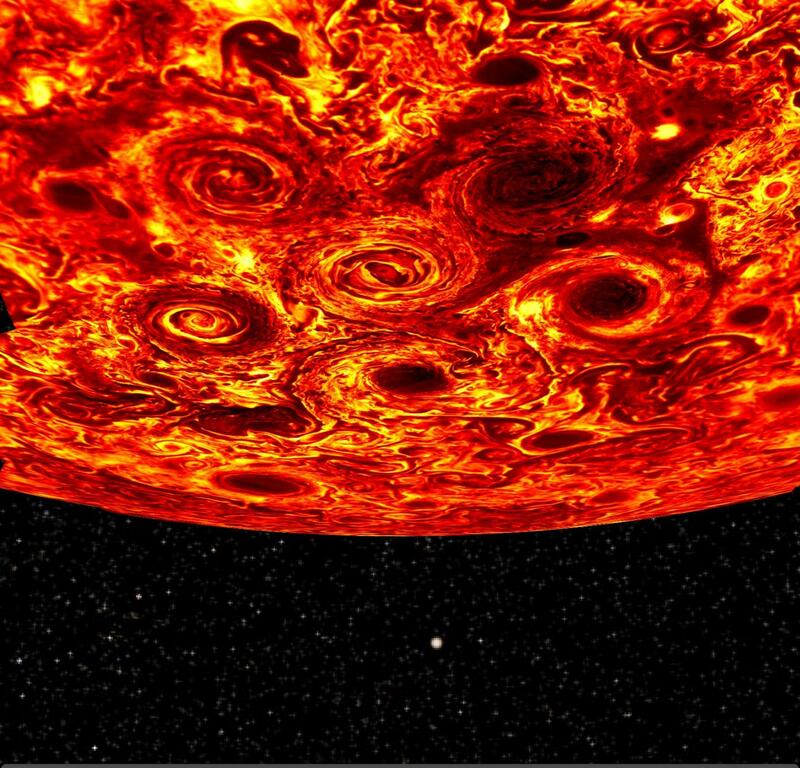 The study, authored by scientists from an international group of institutions including the University of Chicago, is published in March 8's Nature as part of a set of four papers dedicated to new observations from the Juno spacecraft. Juno launched in 2011 with the ambitious mission of finally seeing beneath the dense clouds covering Jupiter. On July 4, 2016, it finally reached the planet's orbit. Since then it's been orbiting the planet, taking pictures and measuring the planet's profile in infrared, microwave, ultraviolet, gravity and magnetism–and answering questions scientists have had about Jupiter for decades. One of these was the question of what lay at its elusive poles. When scientists got the first images, they were stunned. At the north pole, eight storms surrounded one storm at the center. At the south pole, it was the same arrangement, only with five storms. But the numbers stayed oddly constant; the storms weren't drifting and merging, as our current understanding of the science suggested they should. "They are extraordinarily stable arrangements of such chaotic elements," said Morgan O'Neill, a University of Chicago postdoctoral scholar and a co-author on the paper. "We'd never seen anything like it." The geometry rang a faint bell in O'Neill's mind, though. She found it in the library of strange physical phenomena only observed under special conditions in the laboratory. In the 1990s, scientists observed a similar behavior as they used electrons to simulate a frictionless, turbulent 2-D fluid as it cools. Instead of merging, which tends to happen in such 2-D flows, small vortices would clump together and form equally spaced arrays, or "vortex crystals," around a center. It's not yet clear whether the same physics underlies both these behaviors, O'Neill said, but it is tantalizing. "The next step is: Can you create a model that builds a virtual planet and predicts these flows?" she said. With further studies, they can understand the forces at play in the swirling storms. A greater understanding of the physics behind the flows and dynamics of storms is helpful on every planet; though O'Neill did her PhD on the dynamics of cyclones on gas giants (including a prediction that Jupiter's poles would not look like Saturn's: "I got it…partially right," she said), she now uses similar storm modeling to study hurricanes on Earth. The study was led by Alberto Adriani with Rome's Institute for Space Astrophysics and Planetology. Other authors on the study were from the Jet Propulsion Laboratory, Caltech, the British Astronomical Association, the Southwest Research Institute, NASA Goddard Space Flight Center, the University of Michigan, Cornell University, the University of Atacama in Chile and the Planetary Science Institute, as well as the Institute for Space Astrophysics and Planetology, the University of Bologna, the Italian Space Agency and the Institute of Atmospheric Sciences and Climate, all in Italy. When did animals leave first footprint on Earth?